- All individuals must be registered as participants in IoT Week 2018 devpost. - Participant teams must submit and present the project on Thursday 7th June 2018. - The presentation is a pitch of 5 min describing: project, business idea and demo. - The pitch can be supported with no more than 3 slides. - The business idea must promote the sponsor project in commercial solutions. - The demo can be presented with a video with duration of no more than 3 minutes. Thursday 7th June, at the IoT Week closing ceremony at 17:00 hrs. Considering that the objective of the IoT Week 2018 hackfest is innovation, the use of commercial solutions and commercial products is recommended. Participants are free to use and bring on the day of the final their own products and equipment for demonstration of their project, solutions and technologies. There is no restriction in use of material and equipment, however if the equipment required special support or connections please bear in mind it may not be available for demonstration, if this is the case a demonstration video can be recorded and presented along the pitch competitions as far as the video is not more than 3 minutes duration. - Mobile Devices (Sensors, Smart Phones, Tablets, etc) and Adaptors. - Photo ID and Competitive Spirit! There is no cost for registering and submitting the project in the IoT Week 2018 Innovation Hackfest. However there is a 50 Euro registration charge per participant that includes coffee break and lunch for the IoT innovation hackfest on Thursday 7th June 2018 and also give you access to the IoT Week 2018 exhibition area during the IoT Week to meet your sponsor project and clarify doubts to help you to improve your demo/video/slides and/or pitch. A chill space to fine tune your Demo / Presentation and Pitch. Design, create and prototype a project-idea by using the BIG IoT technologies. They should help you to enable “IoT innovation” by creating a NEW BUSINESS IDEA based on interoperable and accessible IoT marketplace solutions, or to promote “IoT knowledge transfer” by using BIG IoT software components to EXTEND A CURRENT PRODUCT/SOLUTION to enable the exposure of data services in the form of offerings in a global market as part of a BIG IoT-based IoT ecosystem and to motivate BIG IoT-based services and applications that can be commercially exploited “accelerating” MARKET ADOPTION of the IoT DATA MARKETPLACE. The pitch and the presentation of your project-idea, should be supported by implementation work (code) and/or a simulation video that should be submitted to be considered part of the IoT Innovation hackfest final evaluation. BIG IoT is a H2020 European project that focuses on providing open source tools to enable IoT Ecosystems interoperability, with BIG IoT technologies it is possible to enable cross-standard, cross-platform, and cross-domain IoT services and applications. BIG IoT is part of the European IoT Platforms Initiative (IoT-EPI). BIG IoT focuses on services and applications, starting with connecting IoT platforms from the BIG IoT partner companies and implement services and applications in different cities i.e. Barcelona, Piedmont, and Berlin/Wolfsburg. The BIG IoT project has implemented: The BIG IoT API and the BIG IoT Marketplace. The BIG IoT consortium aims that with these two technologies, it is possible to build IoT ecosystem(s) where European companies can exploit their data business potential. The figure below illustrates the BIG IoT approach. All registered platforms and services are discoverable on the Marketplace. The API gives the functionality (discovery, data access, security, etc) to easily build IoT applications on top of this ecosystem. What you can do with the BIG IoT API and the BIG IoT Marketplace? You can Integrate … with the BIG IoT Ecosystem by implementing its standards-based BIG IoT API. This enables an interoperable interaction of services and applications with existing IoT platforms. You can Share… your services and applications through the BIG IoT Marketplace. It enables their advertisement, discovery, monetization, and reuse by the ecosystem participants. You can Engage… your potential customers to offer them data services in the form of offerings and they can act as online consumers to your data assets. BIG IoT API is offered as a lib, you can download it [here], with this BIG IoT API lib, IoT platforms and services can provide their resources in a generic way. Using the same API lib, IoT applications (but also services) can consume those resources very easily. In this way, the BIG IoT API lib solves the today’s interoperability issues between IoT providers and consumers. BIG IoT Marketplace is a platform or service using the lib, for registered resources that can be exposed as offerings on the BIG IoT Marketplace. You can have access to BIG IoT Developers’ Guide with instruction for: Getting started / Provider Tutorial / Consumer Tutorial / Release Notes / Examples of the last stable versions, https://big-iot.github.io/ from which you also have the possibility to Download BIG IoT LIBs. More information in BIG IoT's project deliverables, in particular deliverables 3.2 and 4.2. If you are looking to more details about the BIG IoT project go to BIG IoT website http://big-iot.eu/ where you can find a list of public deliverables with more details about the project and technologies. It is easy to get started to dive into the BIG IoT ecosystem. These libs allow providers to register and manage their offerings and consumers to access offerings from the BIG IoT Marketplace for example, an IoT platform could offer data on the status of parking spots (occupied or available) within a city. An IoT service could provide the functionality to reserve resources. An application could access both with the BIG IoT API and combine them to enable reservation of parking spots. See at the Figure below the BIG IoT Markeplace Design. Design, create and prototype a project-idea by using the symbIoTe technologies. They should help you to enable “IoT innovation” by creating a NEW BUSINESS IDEA based on interoperable and secure IoT solutions, or to promote “IoT knowledge transfer” by using symbIoTe IoT services and software components to extend A CURRENT PRODUCT/SOLUTION to offer shared sensors and actuators, and to contribute to a symbIoTe-based interoperable IoT ecosystem for the development of cross-platform and cross-domain IoT applications to “accelerate” MARKET ADOPTION of interoperable IoT platforms/solutions. The pitch and the presentation of your project-idea should be supported by a working implementation (code) and/or a simulation video that should be submitted to be considered part of the IoT Innovation hackfest final evaluation. symbIoTe is an H2020 Research and Innovation Action and member of the IoT-European Platforms Initiative cluster that addresses a challenging objective of creating an interoperable IoT ecosystem. symbIoTe facilitates the cooperation of vertical IoT platforms, which are today typically offered as closed systems, to simplify the development of cross-domain and cross-platform IoT applications. symbIoTe is an interoperability framework to enable IoT platforms to open up access to their devices/services in a controlled and secure manner, offering thus shared sensors and actuators with a goal to create new revenue streams for IoT platform providers. symbIoTe is not ‘yet another IoT platform’, as it is not designed to store any sensor-generated data, but rather a mediator facilitating the exchange of the necessary metadata describing the exposed IoT devices/services. Thus, symbIoTe mediates between IoT-based applications and platforms/devices/services or between various platforms. Application developers can design, build and deploy IoT-based applications in the symbIoTe ecosystem without deploying and owning any devices or IoT infrastructure. The main goal of symbIoTe is to devise a flexible and secure interoperability middleware across IoT platforms facilitating rapid development of IoT applications across platforms, platform collaborations as well as dynamic and adaptive smart objects and environments. This is accomplished by a series of innovations introduced by symbIoTe. 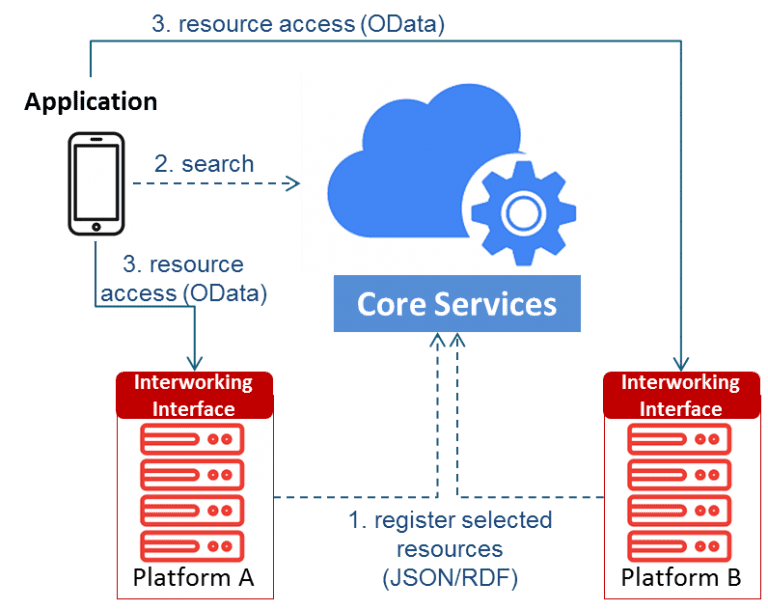 The first innovation refers to building an IoT search engine for connected (virtualized) IoT resources, both sensors and actuators, where IoT platform providers can register their deployed resources and other platforms/applications can search and access them. The second innovation involves an abstraction layer for unified and secure usage of those resources across platforms. A third key ingredient is to implement high-level, domain-specific APIs (“domain enablers”) for rapid cross-platform application development. What can you do with the symbIoTe Tools? By leveraging symbIoTe interfaces, developed components and software libraries, IoT platforms are able to offer unified and secure access to their sensors and actuators. The devices remain under full control of platform developers and owners, who define and manage access rights to their infrastructure. On the one hand, this supports application developers to rapidly create and deploy novel IoT applications over unified interfaces without the need to own and operate the IoT infrastructure. On the other hand, IoT platform providers and infrastructure owners are able to increase their user/developer base and create new revenue streams, since their infrastructure is used extensively in innovative cross-domain applications. This creates a vibrant IoT ecosystem facilitated by symbIoTe Core Services mediating between many IoT platforms offering devices, and applications using those devices. The Figure below shows the Interactions between applications, symbIoTe-enabled platforms, and symbIoTe Core Services. Software implementations that extend existing platforms to become part of the symbIoTe ecosystem and deployed sensors and/or actuators. Both the platform and resources need to be registered at an instance of Cloud Services running at symbiote-open.man.poznan.pl and made available for demonstration. Project-idea for a cross-platform or cross-domain application that could be enabled by the symbIoTe ecosystem illustrated by a video. symbIoTe provides a reference implementation of the Interworking Interface written in Java using microservices available at https://github.com/symbiote-h2020/SymbioteCloud. The following components are required to be deployed so as to extend existing platforms: AuthenticationAuthorizationManager, CloudConfigService, Registration Handler and ResourceAccessProxy (RAP). In addition, we use EurekaService and ZipkinService. You need to create a custom RAP Plugin for your platform. symbIoTe offers a deployed instance of its Cloud Services available for this challenge. It is running at symbiote-open.man.poznan.pl. We will use it to test whether your platform and selected resources are adequately registered and symbIoTe-enabled. The open source implementation of the Core Services is available at https://github.com/symbiote-h2020/SymbioteCore. symbIoTe introduces the Core Information Model (CIM) defining basic concepts that are understood by all platforms. Since it is not possible to standardize everything, symbIoTe allows platforms to define Platform-Specific Information Models (PIMs) as an extension of the CIM. symbIoTe information models are represented as OWL2 ontologies available at https://github.com/symbiote-h2020/Ontologies. For reasons of simplification, you can use JSON descriptors for sensors and actuators, examples are given here. Look at the wiki pages for making your platform symbIoTe-enabled: https://github.com/symbiote-h2020/SymbioteCloud/wiki. We recommend that you follow instructions for Downloading and configuring jar files. Video demonstrating the steps to install symbIoTe Cloud components extending your platform is available here. · Initial steps to build a symbIoTe enabled App. For more details visit the symbIoTe web site https://www.symbiote-h2020.eu/. Design, create and prototype a project-idea by using the FIESTA-IoT Platform and software tools. They should help you to enable “IoT innovation” by creating a NEW BUSINESS IDEA based on Integration of different IoT deployed Infrastructures, or to promote “IoT knowledge transfer” by using FIESTA-IoT online platform and software tools to EXTEND A CURRENT PRODUCT/SOLUTION by integrating multiple IoT systems using semantic interfaces provided by FIESTA-IoT for example, and to use FIESTA-IoT-based tools to enable Semantic Interoperability services and applications to “accelerate” MARKET ADOPTION OF FEDERATED and INTEROPERABLE IoT PLATFORMS. The pitch and the presentation of your project-idea, should be supported by implementation work (code) and/or a simulation video that should be submitted to be considered part of the IoT Innovation hackfest final evaluation. FIESTA-IoT is a H2020 European project that provides IoT Experiment as a Service, an open source middleware infrastructure that federates heterogeneous IoT platforms (testbeds). FIESTA-IoT main objective is to offer a federated entry point to all FIESTA-IoT EaaS services using a single set of credentials for this FIESTA-IoT enable the design and execution of experiments across a virtualized infrastructure i.e. access the data and resources from multiple testbeds and IoT platforms using a common approach. FIESTA-IoT entails the adaptation of the data of those testbeds to a common FIESTA-IoT ontology (i.e. compliance to common semantics), as well as the provision of a common standards-based API for accessing the IoT services of the testbeds. FIESTA-IoT offers three types of tools i) to design and execute experimental workflows, ii) dynamically discover IoT resources, and iii) access data in a testbed agnostic manner. FIESTA-IoT provides an online platform for federating IoT infrastructures (IoT testbeds) using a common semantic model that builds upon ontologies for sensors and observations, IoT concepts, and spatial and temporal contexts. The common semantic model also adopts a taxonomy for sensing devices, measurements, which grows based on the federated IoT testbeds. The figure below illustrates the FIESTA-IoT approach. Data integrity is achieved by a resource and observation validation process. Quality is enforced by a certification suite that testbed providers must pass. In terms of IoT data business intelligence, All testbeds and their sensor devices are required to register with the platform in order to be accessible and make their resources available by the FIESTA discovery and analytics tools. What you can do with the FIESTA-IoT Tools? You can Federate… with the FIESTA-IoT platform by registering heterogeneous IoT platforms using FIESTA-IoT W3C-based (sensors and observations) semantic data models. This enables an agnostic interaction of IoT sensor data services. You can Share… IoT sensor data through the FIESTA-IoT ecosystem using the FIESTA-IoT Experimentation Execution Engine, Experiment Resource Manager and the Experiment Editor UI. They enable discovery, monitoring, and reuse of data by the FIESTA-IoT ecosystem registered experimenters. You can Interoperate… potential IoT data processors integrating IoT testbeds as data providers and enabling data consumers for offering data exchange services in the form of defined experiments that they can act as online services over IoT data resources. FIESTA-IoT TPI Testbeds Platform Interface. The FIESTA-IoT Registry is the IoT storage point where SPARQL endpoint-like, dataset retrieval can be acquired using various formats, and can then be reused with other datasets, based on the query response structure and format. More information about the FIESTA-IoT project is available online at the Website. If you are looking for more details about the FIESTA-IoT project go to http://fiesta-iot.eu where you can find a list of public deliverables and more details about the project and available technologies. The FIESTA-IoT provides a dashboard for testbed monitoring and sensors data provisioning. Metadata management is a core feature in the FIESTA-IoT platform. All testbeds and their sensor devices are required to register with the platform. The registration involves the submission of descriptions which define the properties of a “Resource”. All descriptions must comply with the FIESTA-IoT Ontology. All descriptions must comply with the FIESTA-IoT Ontology. Once validated, it is then stored in the IoT Registry. The IoT registry is also the point of contact for experimenters to discover “Resources” of interest, and hence retrieve the datasets generated by them. Using the IoT registry’s SPARQL endpoint, dataset retrieval can be acquired using various formats, and can then be reused with other datasets, based on the query response structure and format. FIESTA-IoT enable IoT data analytic services in the form of APIs’ enabling Analytics and Reasoning through Federated Analytics Tool FIESTA-IoT FAT) and Reasoning Analytics Tool (FIESTA-IoT RAS). There is a board of industrial, academic experts, investors and the technical expert and the coordinator of the sponsor project(s) whom will evaluate together the winner of the prizes on the 7th June 2018. At the IoT innovation hackfest only one team per challenge will win. Showcase some coding that works. Explain your project/idea focusing on commercial value and impact. C3) innovation idea using project results. Explain how the project results can be commercially used/exploited.